Myoko Kogen combines so many excellent elements into one package; several great ski resorts, endless powder snow, relatively thin crowds, plenty of (permitted) tree skiing, a superb ski school, a friendly, traditional Japanese town, a range of accommodation options and easy access. It’s not surprising then that Myoko’s popularity has soared over the past few years. Some fun tree and gully skiing and easily accessed side and backcountry. The claim to have Japan’s longest run at Suginohara. 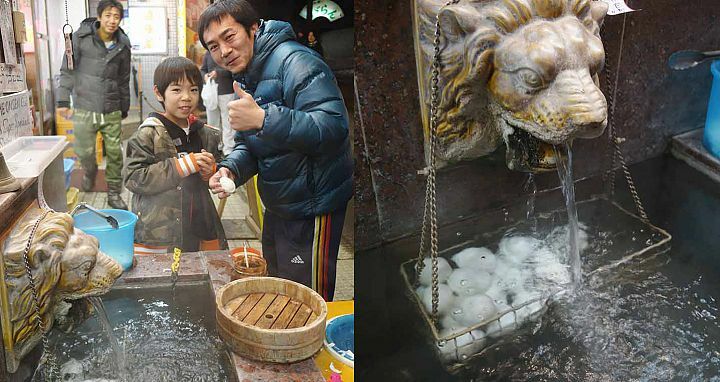 The charming village of Akakura Onsen with a good variety of restaurants and bars. Several ski resorts connected by a shuttle bus. 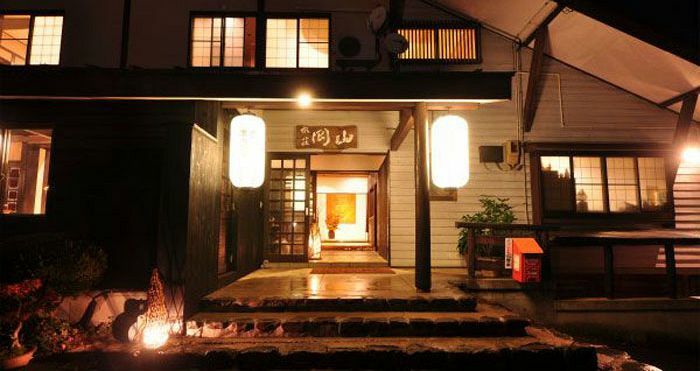 The best place to stay is in Akakura Onsen village. Advanced skiers will enjoy the out-of-bounds skiing. We recommend bringing your own avalanche safety equipment. Nearby Madarao makes a great day trip, and daily bus transfers operate from the Akakura Bus Terminal (￥1000 each way). There is only one ATM in town and it’s in the Post Office and so only open during business hours. Bring lots of cash! Myoko Kogen used to be a little-known gem. But over the past few years it’s developed a reputation as a haven for powder junkies, which means it no longer flies under the radar. And with more than 13-16 meters (depending on your sources) of powder snow that comes directly from the Sea of Japan only 35km away it’s easy to see why skiers are now flocking here. 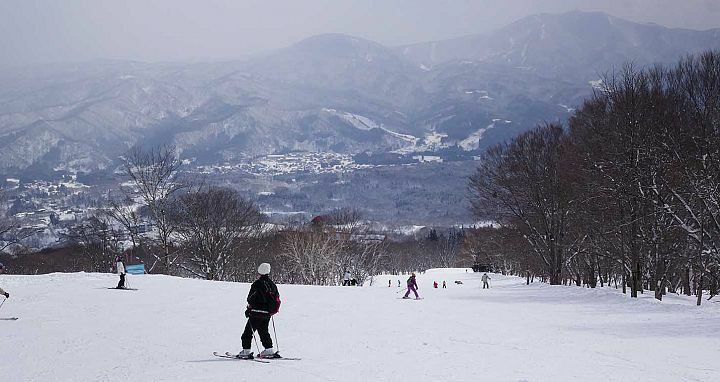 The area known as Myoko Kogen consists of seven ski resorts, including two that are interlinked and four that can be skied on the same pass (and are connected by shuttle bus). There’s a great variety of skiing for all standards, including several good beginner areas (and a great English-speaking ski school), some long, gentle intermediate slopes and for advanced skiers the highlight is powder skiing in the trees as well as access to some great backcountry terrain. Unlike most ski resorts in Japan, the policy against tree skiing is relaxed. There are villages at the base of each resort, but the main place to stay and play is in the charming, traditional village of Akakura Onsen. It has narrow streets with a mix of traditional and new buildings and there’s a variety of good restaurants. While the nightlife isn’t as vibrant as Niseko or Hakuba, those seeking bars to relax in and enjoy a few après drinks late into the night won’t be disappointed. Akakura Kanko makes the claim to being the first official ski resort in Japan and in 1937 the luxurious Akakura Kanko Hotel was built right on its slopes. 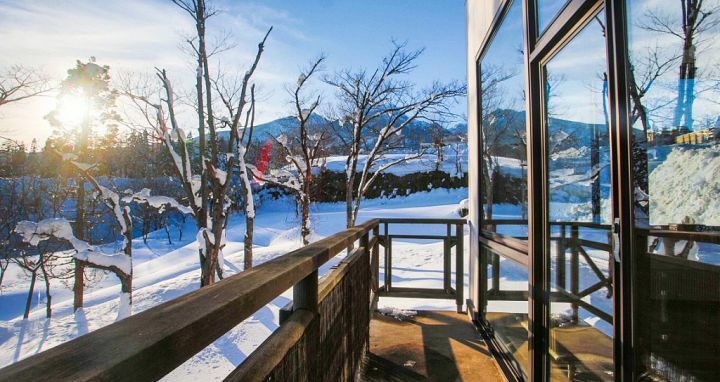 It’s undergone several renovations and today it is probably one of the better ski hotels in all of Japan, including several stunning suites with private outdoor onsen hot baths and views over the slopes and mountains. Skiing in Myoko Kogen is a treat for all levels thanks to a wide variety of options that come from skiing one of the five main ski resorts, and fairly uncrowded slopes. 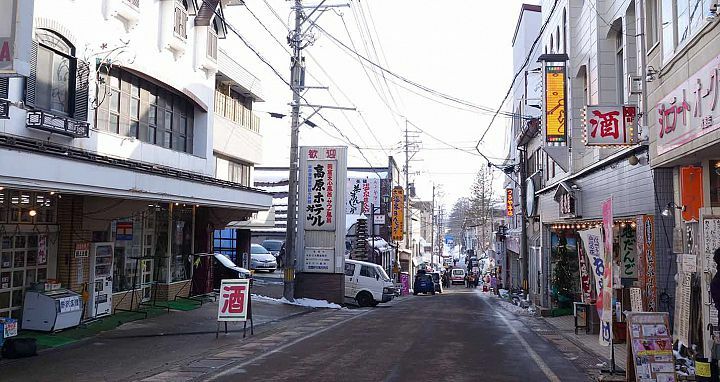 Given that most people choose to stay in Akakura Onsen village, the two most popular ski resorts are Akakura Kanko and Akakura Onsen, which surround the village and are linked together. Akakura Kanko has some of the better steeps and tree skiing in the area and there are gates at the top for accessing backcountry. You can hike to the top of Myoko-san (2454m) and ski right back to the resort. On a powder day, Scout had a great time lapping the Champion #3 Quad and skiing the gully and trees underneath. Unlike most ski resorts in Japan, the resorts in Myoko Kogen have an open policy when it comes to the trees, however it’s still relatively frowned upon to ski under the lifts. There are some areas that are roped off and signs saying out of bounds so be careful skiing these as it could be avalanche territory and you ski them at your own risk. Further down, the resort is characterized by long gentle groomers and a few terrain park features. The lookers left side of the mountain is well serviced by the Sky Cable Gondola. There are several restaurants on the mountain, including a great café at the Akakura Kanko Hotel (but it’s not cheap!). 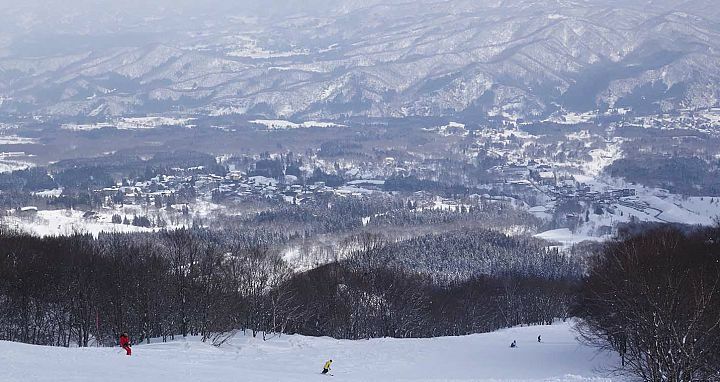 Akakura Kanko connects to Akakura Onsen ski area via a couple of different traverses, which can be difficult to locate and snowboarders may find a bit flat. Once there you will discover that it really is a ski area that’s perfect for beginners and lower intermediates, or for getting home at the end of the day. There is night skiing here with only the Kumodo #2 Quad operating, but this is also where the terrain park is so it can be great for those looking to hone their park skills into the evening. 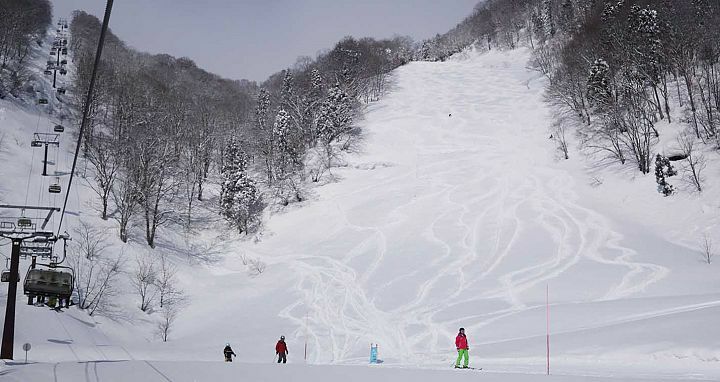 Myoko Suginohara Ski Resort is about a 20-minute shuttle ride up the valley and features long, groomed ski runs. It claims to have the longest ski run in Japan. 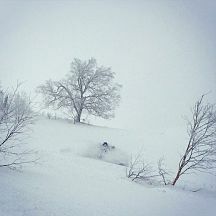 It’s perfect for intermediates and, like Kanko, advanced skiers will get more of a thrill in the trees and side country. Because it’s south-facing, the powder doesn’t hold up so well here. There’s also an expansive terrain park. Suginohara is definitely worth a day trip and is easily accessed on the regular ski shuttle bus. Ikenotaira Onsen is the resort in the middle of the valley. There’s not much to it apart from a few groomed runs, a little bit of tree skiing, a terrain park and halfpipe. Seki Onsen is part of the Myoko family, but a little separated. It is pretty tiny and only has a couple of old lifts, yet it’s worth a day trip, particularly after a big dump of snow. It’s got some great tree skiing, including a few steep pitches. We would recommend getting a guide, or at the least having your own avalanche safety knowledge and equipment as the area isn’t avalanche controlled and we’ve heard the patrol don’t even have transceivers - although this may have changed. Sadly there is no shuttle to Seki Onsen, however you can get a taxi for about ¥5000, or book a day tour from your hotel for ¥5500 (includes lift ticket, lunch coupon, and return transfer). It would also be definitely worth doing a day trip to nearby Madarao, which often has great powder and good tree skiing. It's only 45 minutes away, and a bus operates daily from the Akakura Bus Terminal. Tickets can be bought on the day, ¥1000 per person each way. 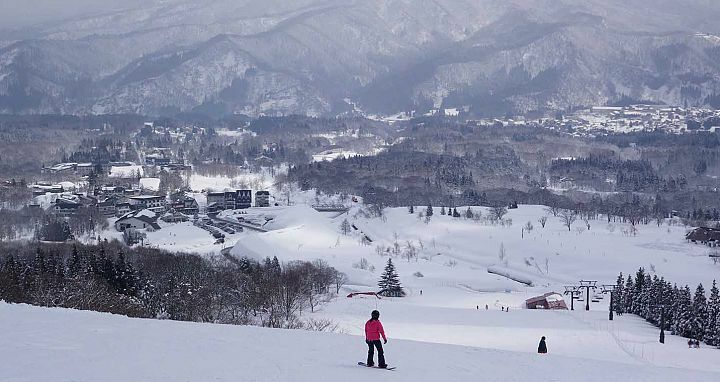 Apart from being a more authentic Japanese cultural experience than other Westernized resorts, the biggest reason Myoko is great for families is the fantastic ski school. Owned and run by a really lovely couple (she’s Japanese and he’s Australian), Myoko Snowsports makes everything easy. They have group and private ski and snowboard lessons in English and it’s well organized for different standards and desires, including multi-resort tours, freestyle and advanced programs. Kids can start lessons at age 3. They even build their own private terrain park to learn the ropes (and rails!). The store has an excellent range of equipment to buy and for rent (including gum boots for walking around town), offers photography sessions, and even has a little café and restaurant in the back of their main shop. 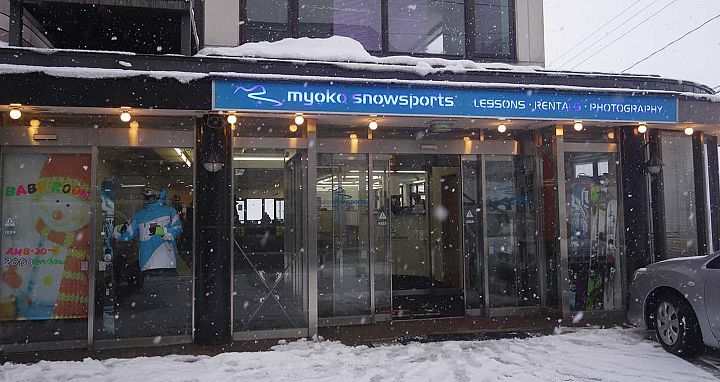 You can book lessons and rentals at Myoko Snowsports via Scout as part of a Myoko Ski Package. Another reason Myoko works for families is its accessibility. There’s a few ski-in ski-out hotels, and the Akakura Onsen village is easy to wander around and a safe environment for kids. Unfortunately there are no self-catering lodging options but there are some great restaurants, most of which have English menus, including a great pizza place for fussy eaters. Whether you are after a traditional ryokan, a budget hotel, a ski lodge or a fancy five-star hotel, there is a wide range of accommodation in Myoko! 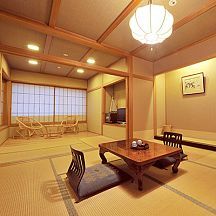 Visitors can choose between Western (Western single beds) or Japanese-style rooms (futon beds on tatami matting), and rooms with or without ensuite (or only half-ensuite, toilet and washbasin). The only thing missing are self-catered apartments. 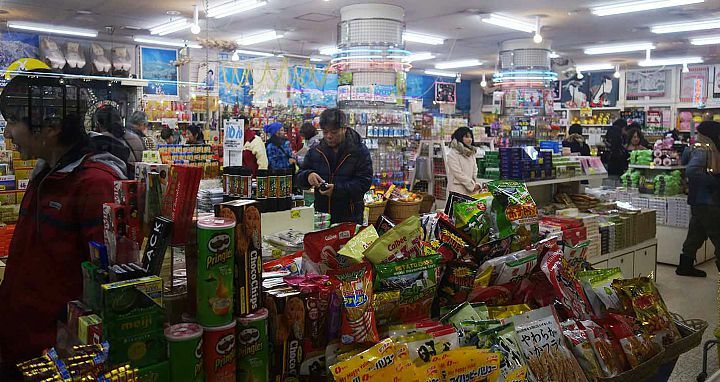 If these are a necessity you’re better off in Hakuba or Niseko and there are a few options in Nozawa Onsen and Furano. 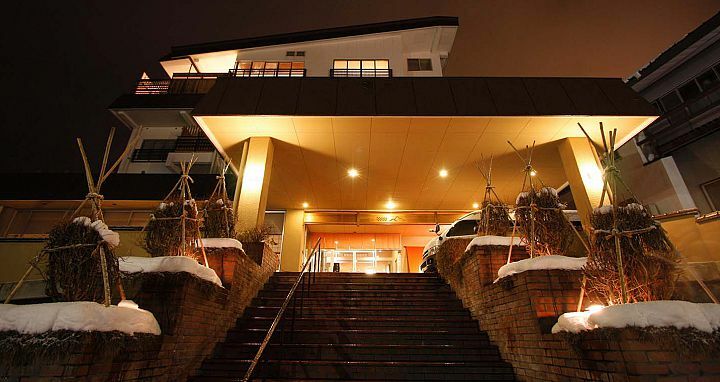 Most promotional photos of the Myoko Kogen area show pictures of the iconic Akakura Kanko hotel. It’s a luxurious hotel and rooms that face the valley have breathtaking views of the mountains. It would be the perfect place to stay on a honeymoon! Most visitors choose to stay at Akakura Onsen or Shin-Akakura Onsen since this is where there’s a wide variety of lodging to choose from as well as the restaurants and bars. It is possible to walk from Shin-Akakura Onsen to Akakura Onsen – it takes about 10-15 minutes along the main road. Beyond the multitude of backcountry skiing options, there are only a few other activities on and off the snow. Myoko Snowsports offers snow bikes for hire, with rates that include an instructor. There are a few souvenir shops in Akakura Onsen, but the main other activity would be having a soak in an onsen. 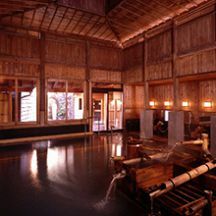 Most hotels have their own but there are two public onsen in the village. A couple of great cultural attractions are sited not far from Myoko, but you’ll require your own wheels (or a very expensive taxi ride) to get to them. These include the Snow Monkeys and Zenkō-ji Temple near Nagano, the Matsumoto Castle and the Daio Wasabi Farm. An afternoon tour to the Snow Monkeys can be organised through your hotel with a local travel company. It’s very easy to get to Myoko Kogen. You can either take a direct Nagano Snow Shuttle or a Chuo taxi from Narita airport or you take the bullet train from Tokyo to Nagano and then the local train to Myoko Kogen Station. The total train travel time from Tokyo is about 3.5 hours. You can easily do the train option all the way from the airport by adding the Narita Express to the start of the trip. From Myoko Kogen Station you can catch a taxi or a bus, or many hotels will offer a free pick-up. You can also catch a public bus from Nagano, however there are only two a day, or a shuttle. Transfers can be organized and booked for you when buying a Myoko Ski Package via Scout. If you are staying in Akakura Onsen you can easily discover everything in the village on foot and the ski lifts are usually within a 10-minute walk. There are some ski-in ski-out hotels. There is a free shuttle that operates relatively frequently throughout the village if you do find yourself finishing the day at the wrong end, and it also goes further afield to Suginohara and Ikenotaira. To get to Seki Onsen, you can catch a taxi (ask your hotel to arrange the taxi the night before and don’t forget to organize your return trip at the same time) or book a day tour directly with your hotel. For Madarao you can book a guided day tour through one of the local operators, or simply jump on the local bus headed to the ski resort (¥1000 per person each way). The easiest way to get to the nearby resorts of Hakuba, Nozawa Onsen and Shiga Kogen is on the Nagano Snow Shuttle. It takes about two hours and you swap buses in Nagano, but it’s a simple and well-organized process. There are two departures each day and the earliest bus leaves Myoko Kogen at 10.30am. Day trips to other resorts, including Shiga Kogen and Nozawa Onsen, can be organised through a local guide (ask Scout for details). You can book your Nagano Snow Shuttle via Scout as part of a Myoko Kogen Ski Package. 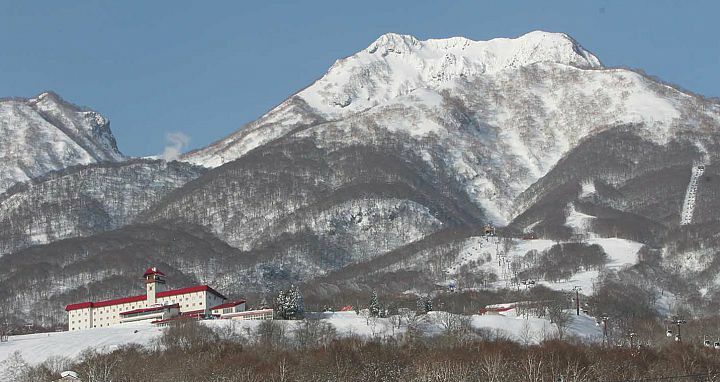 Myoko Kogen ski resorts generally operate from December until early April. It snows a lot in Myoko, particularly from mid-December till mid-February. Although it is still fairly small, its popularity is soaring, so Myoko is very busy in January and February and rooms sell out fast, particularly on weekends. Many hotels can also be taken up by big school groups. Myoko seems to empty considerably after the first weekend in March, yet the snow can still be really good so it’s a great time to get a good value room and have the village much quieter.